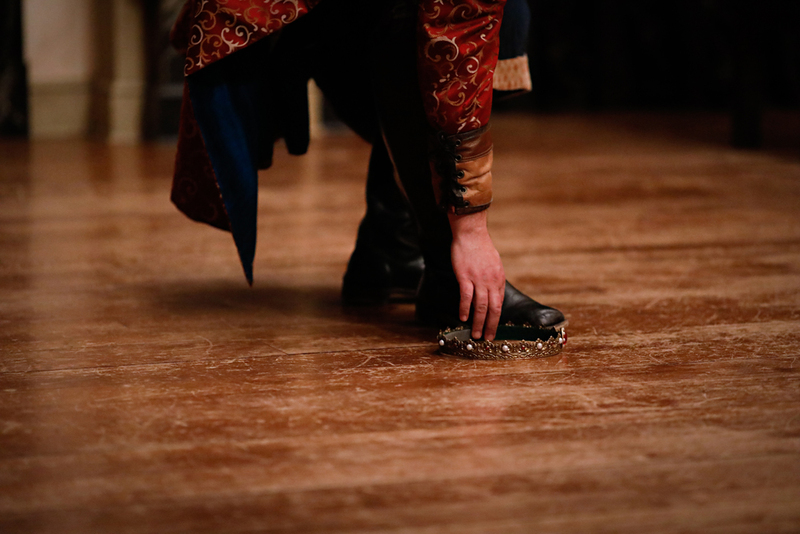 You may my glories and my state depose, but not my griefs; still am i king of those. Shakespeare’s magnificent exploration of the lives and deaths of England’s kings is one of his crowning linguistic achievements. 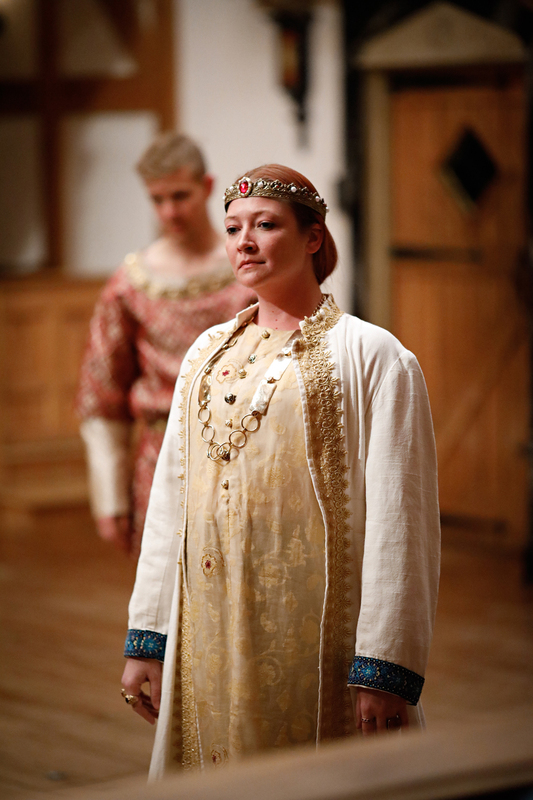 Pitting Richard II, a man of words, against Bullingbrook, a man of action, Shakespeare raises the art of language to new heights, while reminding us that rulers “feel want, taste grief, and need friends.” ASC veteran Sarah Fallon wears (and gives away) the crown as Richard. 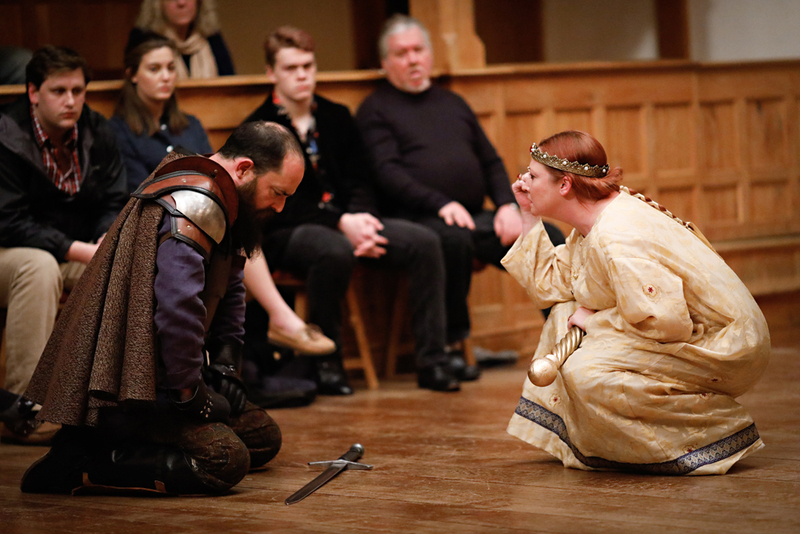 John Harrell, Chris Johnston, Allie Babich, and Benjamin Reed in RICHARD II. 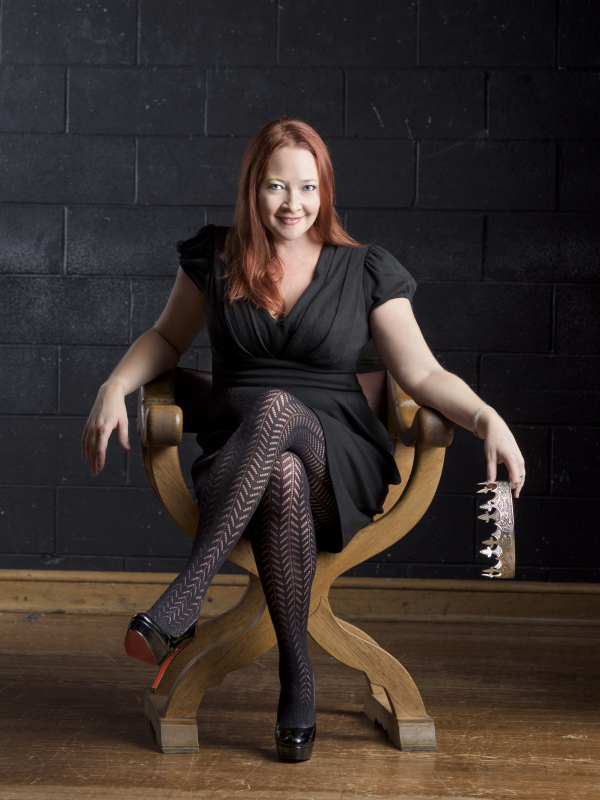 Photo by Lindsey Walters. 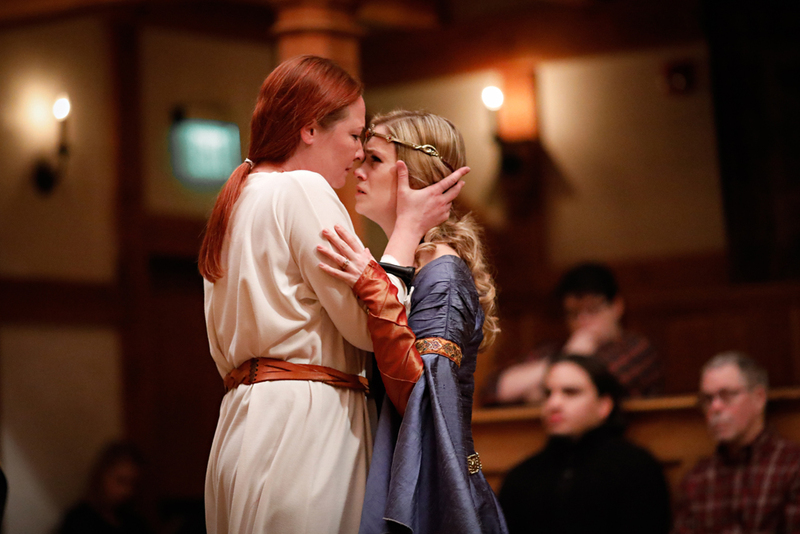 Sarah Fallon as Richard II and Lauren Ballard as Isabel in RICHARD II. Photo by Lindsey Walters. David Anthony Lewis as Bullingbrook in RICHARD II. Photo by Lindsey Walters. 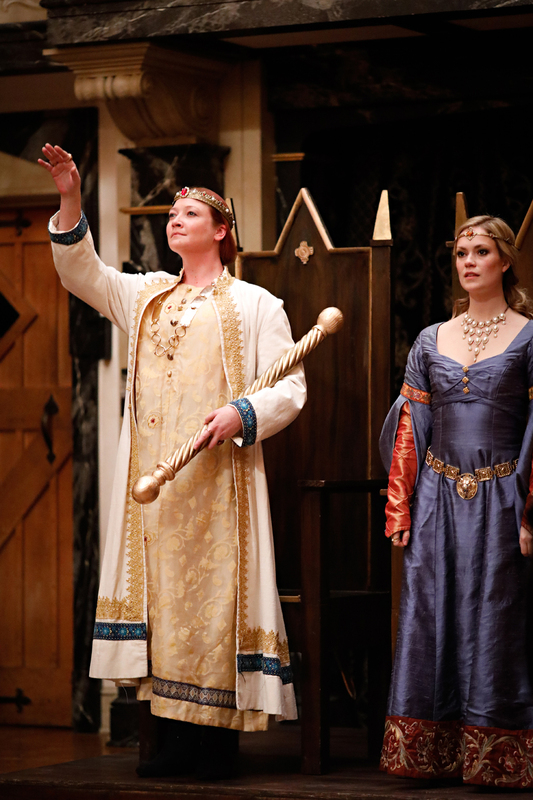 Christopher Seiler as John of Gaunt and Shunté Lofton as Duchess of Gloucester in RICHARD II. Photo by Lindsey Walters. 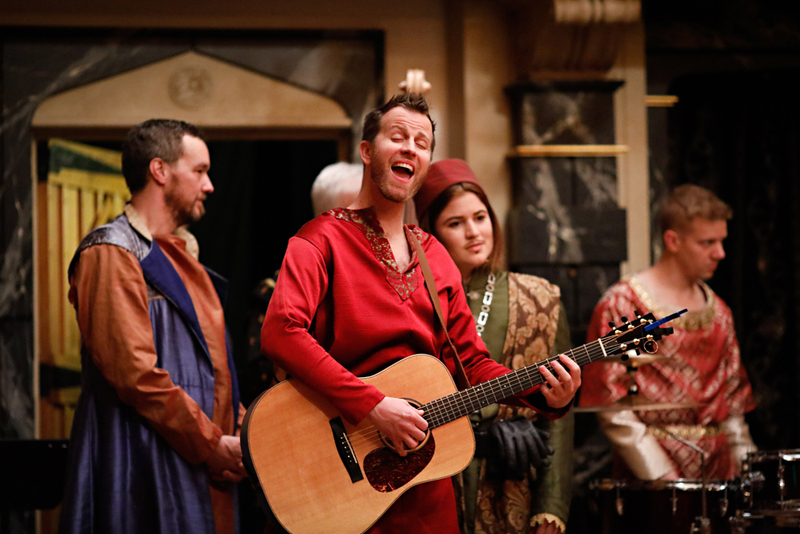 David Anthony Lewis as Bullingbrook, Sarah Fallon as Richard II, and Josh Innerst as Mowbray in RICHARD II. Photo by Lindsey Walters. 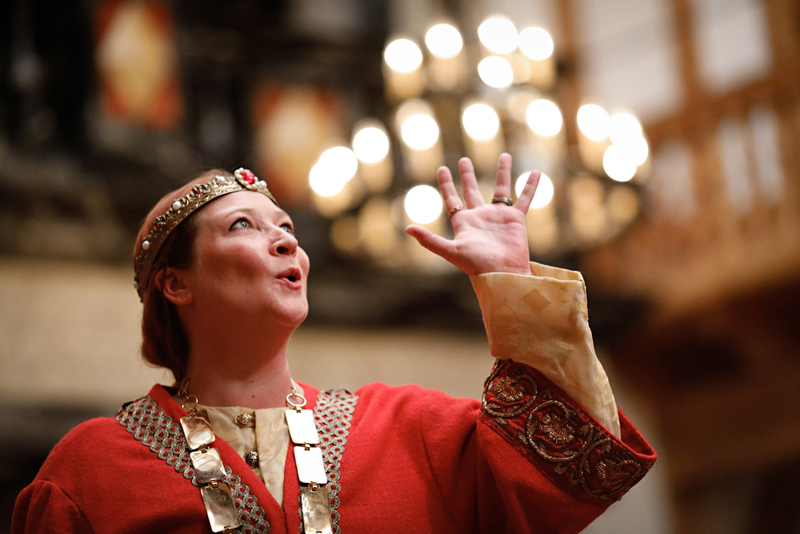 Sarah Fallon as Richard II in RICHARD II. Photo by Lindsey Walters. 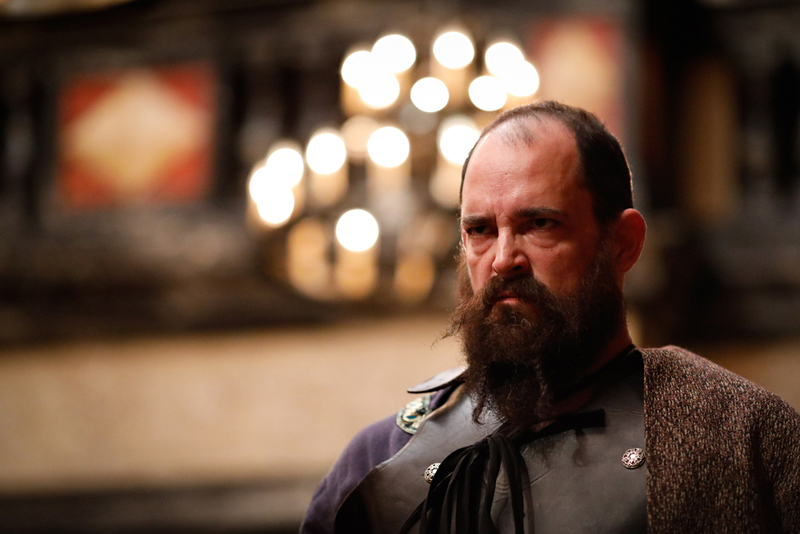 John Harrell as Duke of York and Tim Sailer as Earl of Northumberland in RICHARD II. Photo by Lindsey Walters. 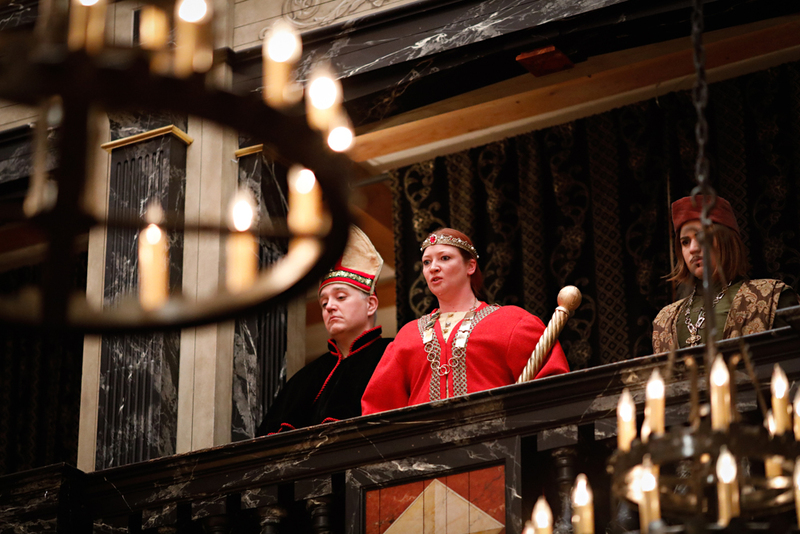 Christopher Seiler as Bishop of Carlisle, Sarah Fallon as Richard II, and Allie Babich as Duke of Aumerle in RICHARD II. Photo by Lindsey Walters. 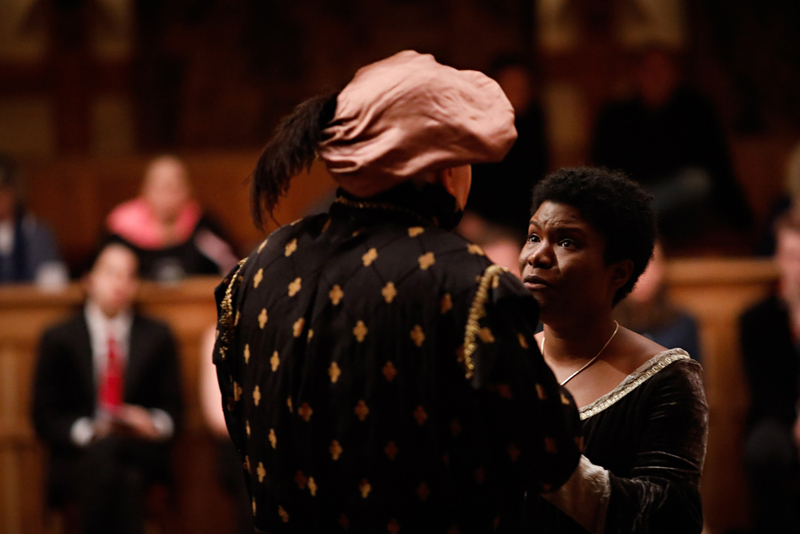 David Anthony Lewis as Bullingbrook and Sarah Fallon as Richard II in RICHARD II. Photo by Lindsey Walters. 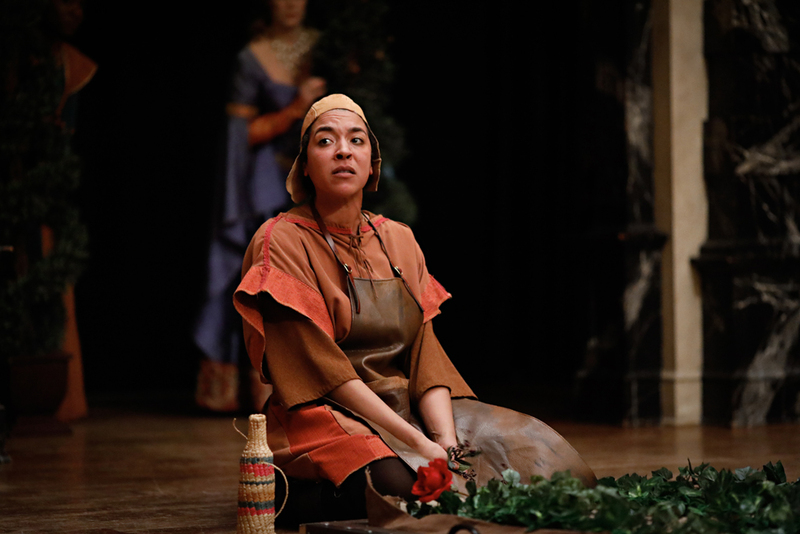 Jessika Williams as Gardener in RICHARD II. Photo by Lindsey Walters. 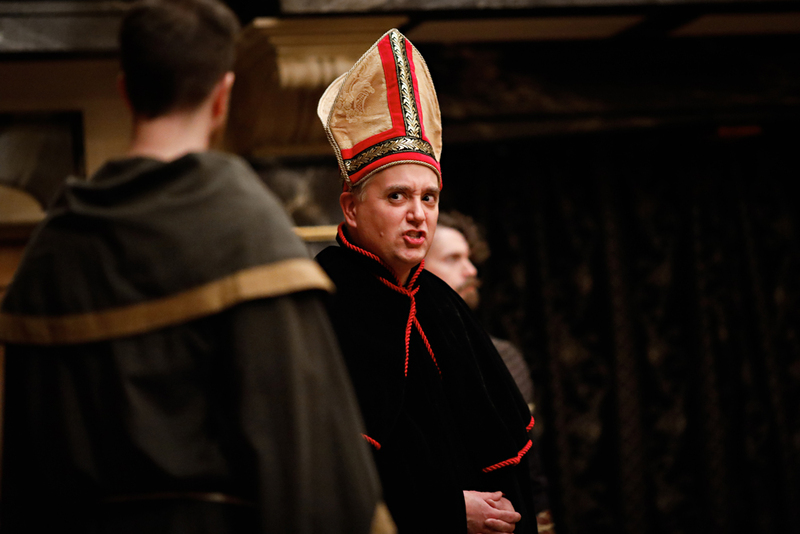 Christopher Seiler as Bishop of Carlisle in RICHARD II. Photo by Lindsey Walters. 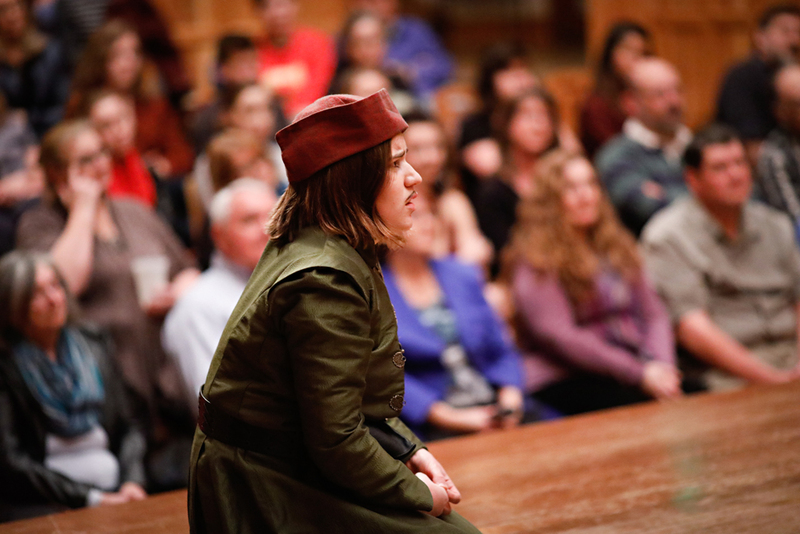 Allie Babich as Duke of Aumerle in RICHARD II. Photo by Lindsey Walters. 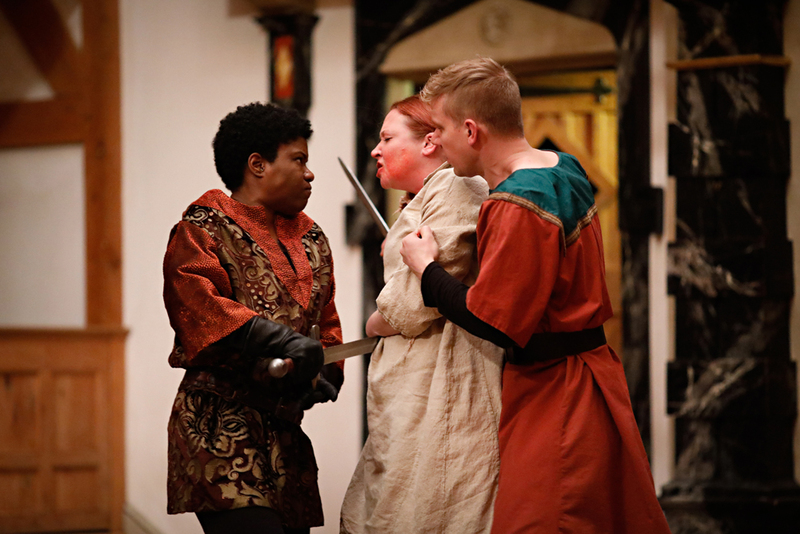 Shunté Lofton as Sir Piers Exton, Sarah Fallon as Richard II, and Benjamin Reed as Servant in RICHARD II. Photo by Lindsey Walters. 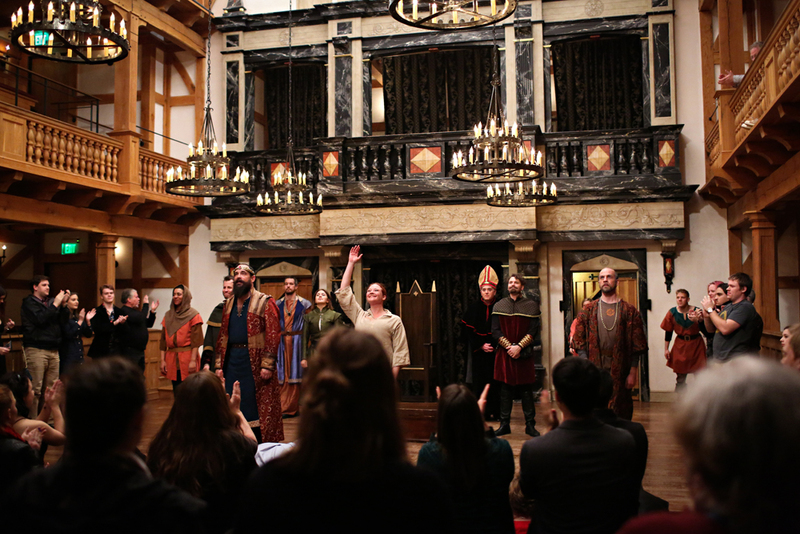 The cast of RICHARD II. Photo by Lindsey Walters. 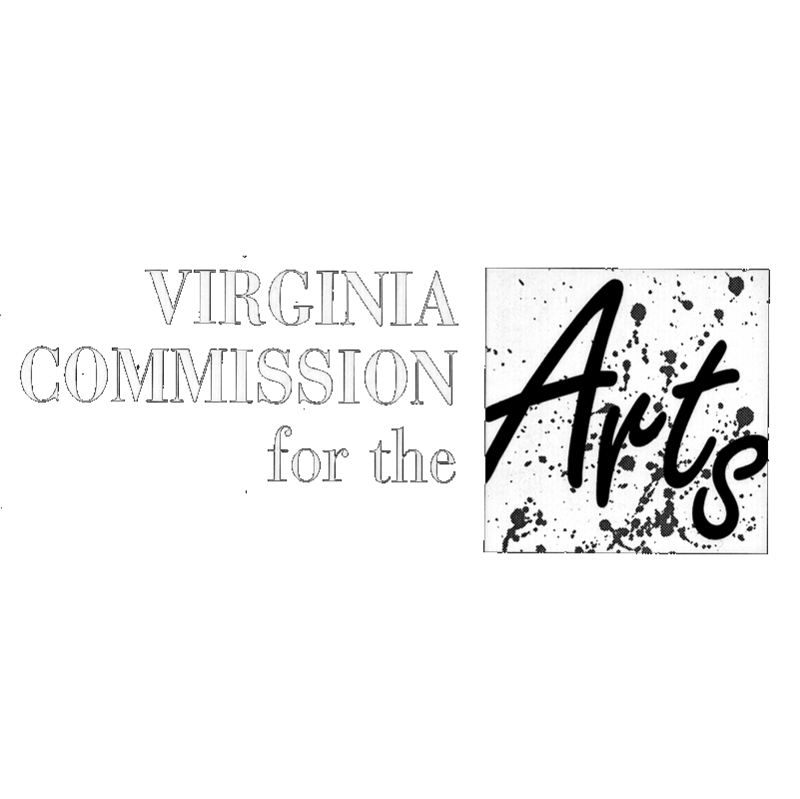 Stuff that Happens BEFORE the play . . .
Thomas of Woodstock, the Duke of Gloucester and uncle of King Richard II, is imprisoned and murdered.  Richard’s cousin Henry Bullingbrook, the Duke of Hereford, accuses Thomas Mowbray of plotting Gloucester’s death. 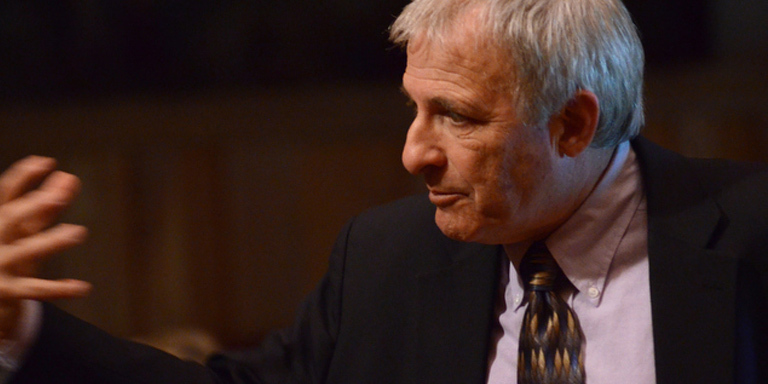 Mowbray denies the accusation and in turn charges Bullingbrook with treason. 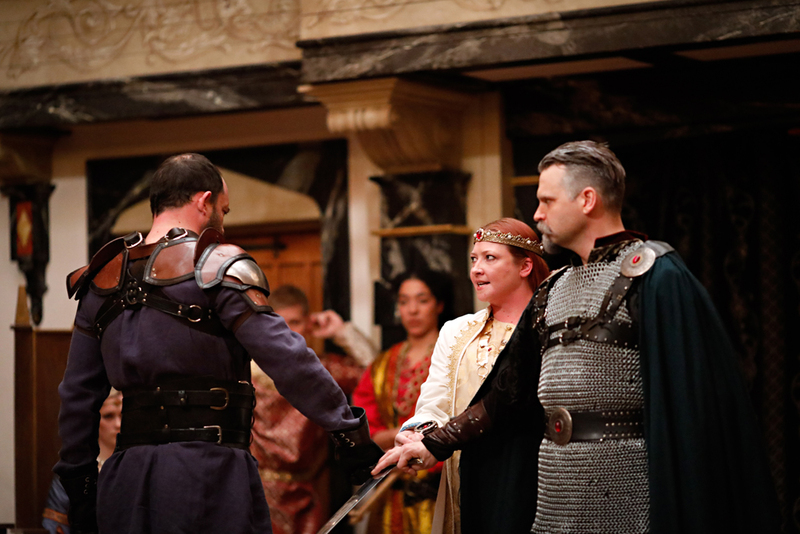 Richard decrees that Bullingbrook and Mowbray must settle their bitter dispute by mortal combat. Before the combat begins, Richard changes his mind and banishes the feuding Dukes instead: Bullingbrook for ten years (later reduced to six), Mowbray for life. Both swear they will never plot against the king. Before he dies, Gaunt speaks of his love of England and accuses Richard of gross misrule. 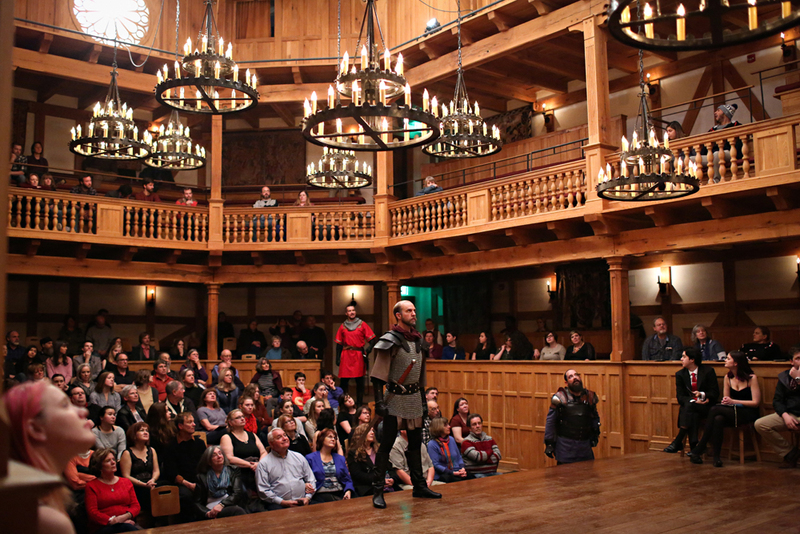 Richard seizes Gaunt’s wealth and lands, thus robbing Bullingbrook of his inheritance. Richard departs for Ireland, leaving the Duke of York (Richard and Bullingbrook’s uncle) in charge of England. Rejecting his sentence of banishment, Bullingbrook returns from exile to reclaim his rightful inheritance. The Earl of Northumberland and other lords rush to his side. York confronts Bullingbrook, but claims to “remain neuter” in the conflict between his nephews Richard and Bullingbrook. Bullingbrook and Richard return to London. Abdication, imprisonment, and assassination ensue.